White might not be the most practical colour for kitchen furniture, especially if the kitchen is small – maintenance can be quite high. Yet, if you do not mind regularly taking care of your white kitchen tables and chairs, you have a chance to create a very light and modern atmosphere in your room. In fact, no other colour will look so stylish and time-relevant in a contemporary kitchen. One of the biggest advantages of white kitchen tables and chairs, and white furniture in general, is that it can be easily contrasted with any other furniture / wall / floor shade you have in mind. Sure, the most stylish way would be to contrast white with something darker – black, dark grey, brown, etc. However, you can also choose brighter furniture arrangements – for example, white chairs with bright red cushions. There is a very impressive range of materials to choose from. The classic kitchen arrangement is solid; the most affordable one is MDF; the most elegant one is tinted tempered glass. Sure, there is also some ABS plastic furniture in stores, which is also a cheap and quite a durable solution, but it hardly ever looks impressive. All in all, you should prefer materials that would be easy to maintain and to clean – this is always the wisest choice for kitchen furniture. Similar to the materials, the designs vary from very simple ones to highly complex, abstract shapes. Quite logically, if you are working on a traditional decoration scheme, you should choose in favour of simple designs. If you are trying to create modern environment in your kitchen, you can surely go with something more complex. On the whole, whatever design or material you choose, the chances are that your white kitchen tables and chairs will remain time-relevant over the years. White, regardless of its shape, is one of the most interior friendly arrangements; plus, the colour is neutral, so the whole solution can be justly considered timeless. 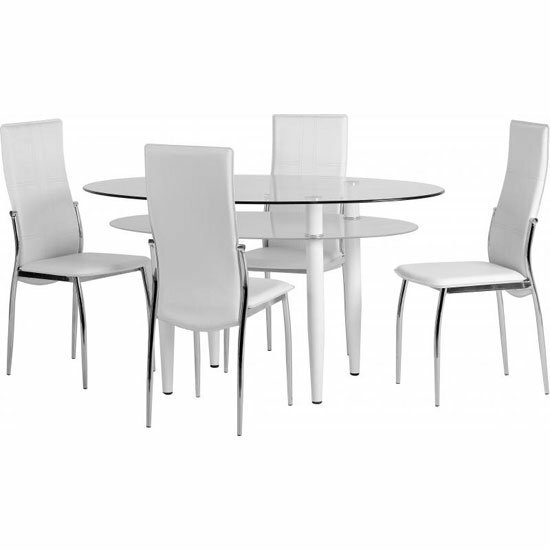 If you are looking for contemporary white kitchen tables and chairs, take a look at the selection in Furniture in Fashion . This is one of the biggest e-commerce websites in the United Kingdom, offering a fantastic selection of modern and traditional furniture arrangements. In addition, the site is oriented towards the UK audience, so any time you shop with this platform, you can count on a quick delivery of every furniture piece you purchase.